Australia - Telecom period: 1975-1988. Ordinary rate transmission form: AT-TO-14. Heading and notes: Form number T.X. 41. Heading is TELEGRAM with TELECOM. AUST. above or on right with logo. 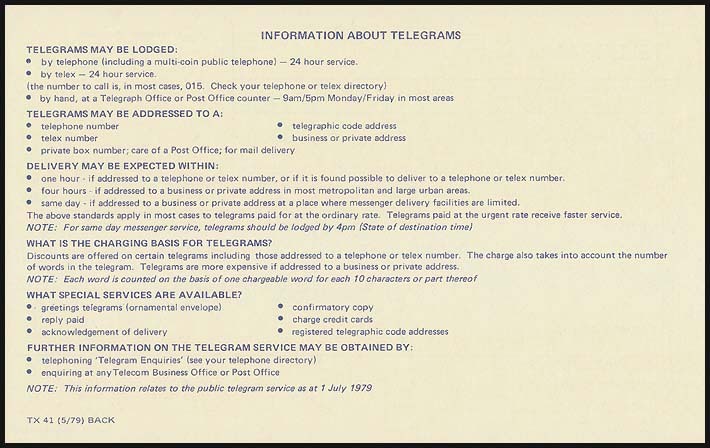 Information about Telegrams (later printings). Colours (text & form): Blue on deep yellow. Size of form overall: (A) 124 × 204 mm. (B) 127 × 203 mm. 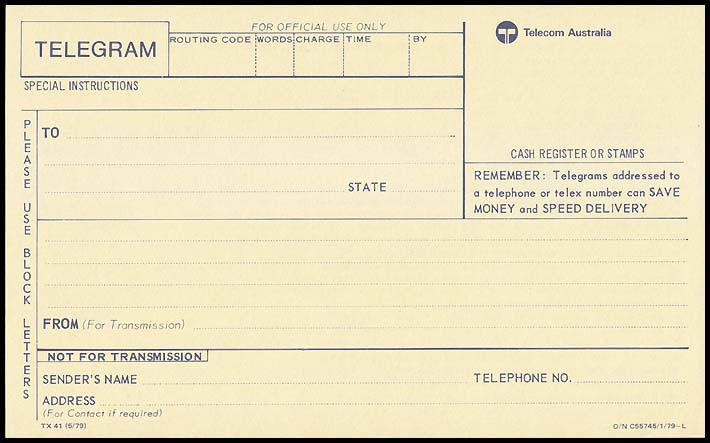 14D: TELECOM AUSTRALIA with logo positioned at right but no vertical bar in G of TELEGRAM. Transmission form used at Queen Victoria Building, N.S.W. on 11 January 1977. 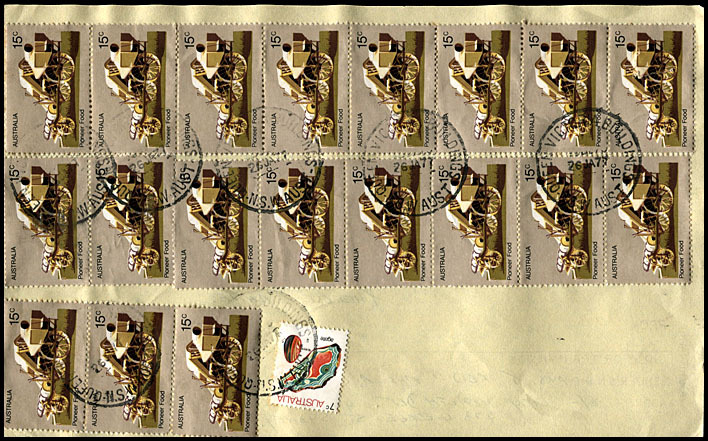 Telegram charge of $1.68 paid by eleven 15c Christmas 1976 stamps plus a 3c Coral Crab. 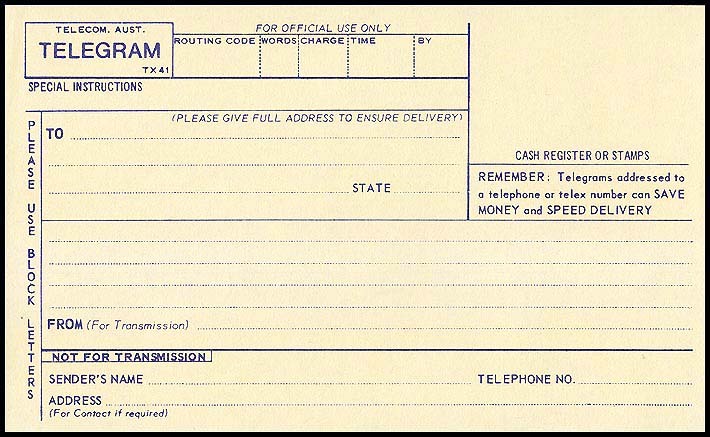 Telegram advises Mrs Rogers of a Money Order sent to her for $227. Reverse side of the above transmission form used at Queen Victoria Building, N.S.W. 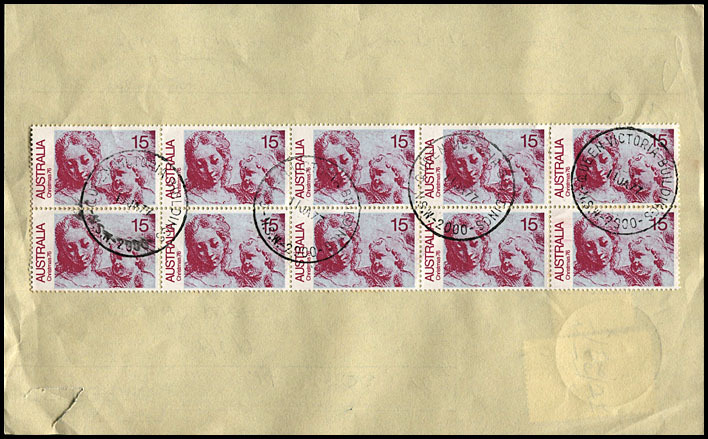 on 11 January 1977 showing the franking for $1.68 paid in low value definitives. Transmission form used at Queen Victoria Building, N.S.W. on 26 January 1977. Telegram charge of $2.92 paid by 19 15c Pioneer Food stamps (issued in 1972) plus a 7c Agate (issued in 1973). 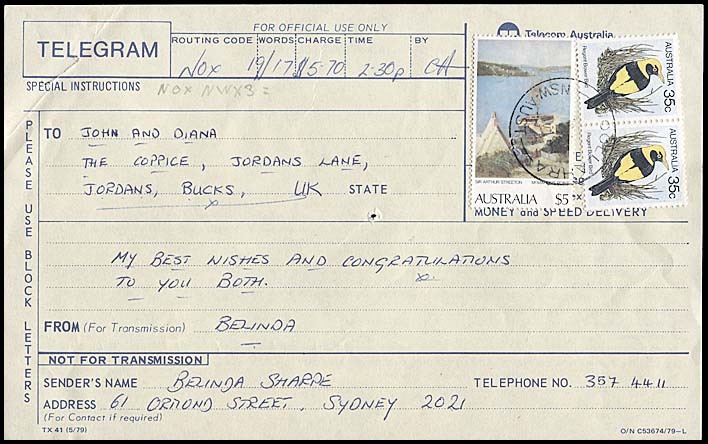 Annotation of GTGS indicates that a Greetings envelope should be used for delivery. Reverse side of the above transmission form used at Queen Victoria Building, N.S.W. 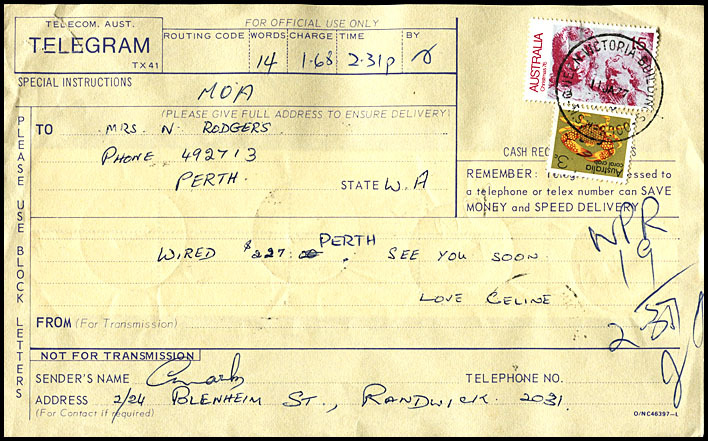 on 26 January 1977 showing the franking for $2.92 paid in low value definitives. The 15c Pioneer Food stamp had ben replaced by the 15c Education definitive in November 1974 and so was clearly surplus stock to be used in any way. 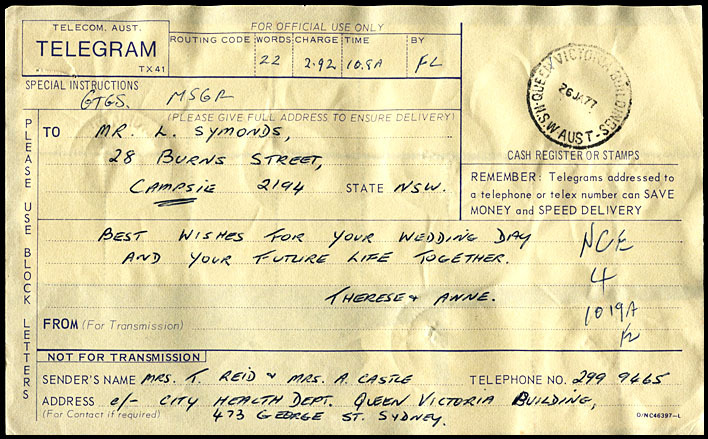 Although the 7c Agate remained available until 1980, its purpose to pay the ordinary letter rate within Australia was not relevant when the cost was increased to 10c in November 1974. Printed in January 1979. AT-TO-14C. 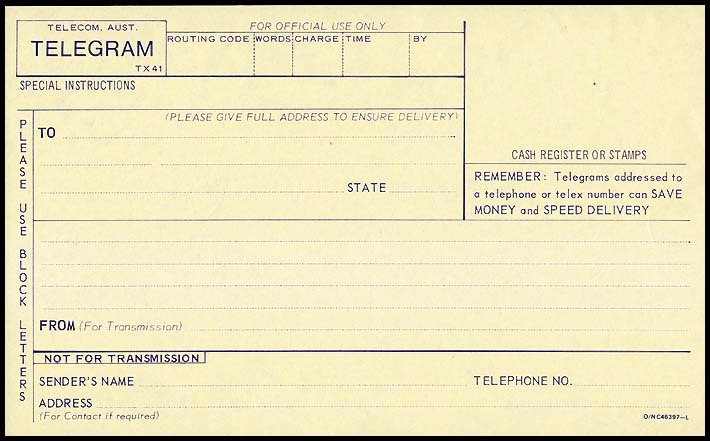 has INFORMATION ABOUT TELEGRAMS on reverse side (see below). Reverse side of the above transmission form. The details are the same for both TO-14C and TO-14D versions. Schedule number O/N C53674/79-L (printed in 1979). AT-TO-14C. 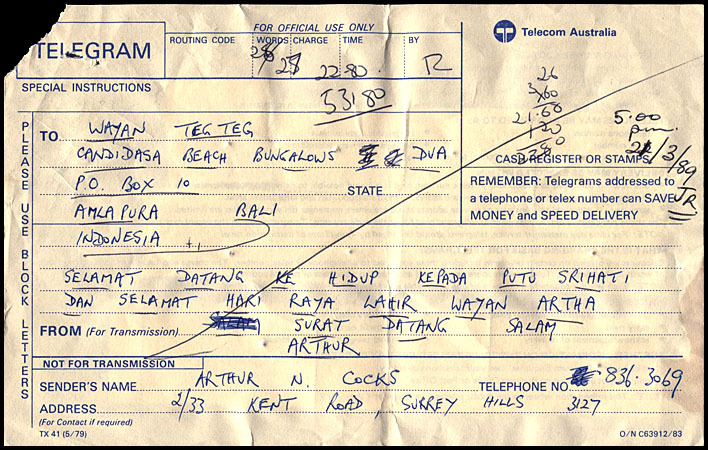 Transmission form used for a message sent from Canterbury, Vic to Bali, Indonesia on 22 March 1989.
other details are the same as for DO-14C including INFORMATION ABOUT TELEGRAMS on reverse side. Reverse side of the above transmission form used at Canterbury, Vic. 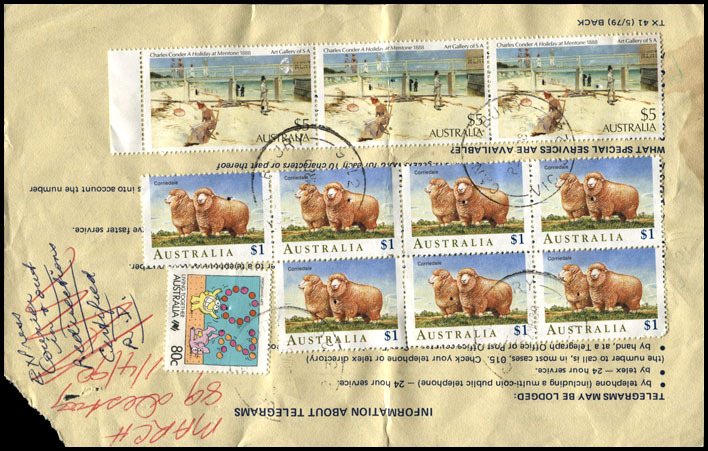 The charges for the international telegram were $22.80 and these were paid with three $5 Mentone, seven $1 Corriedale sheep and a 80c Living Together. RR for a used example. TO-14B O/N C46397-L 11 January 1977 at Queen Victoria Buildings. O/N 49591/76 - L 9 May 1980 at Hamilton, Vic. TO-14C TX41 (5/79) O/N C53674/79 - L 5 August 1983 at Woolahara, NSW. TX 41 (5/79) O/N C55745/1/79-L.
TO-14D TX 41 (5/79) O/N C63912/83 22 March 1989 at Canterbury, Vic. TX 41 (5/79) O/N C71092 Archival strike of 1 April 1989 at Redhill, SA. Overview of Australian ordinary rate transmission forms?